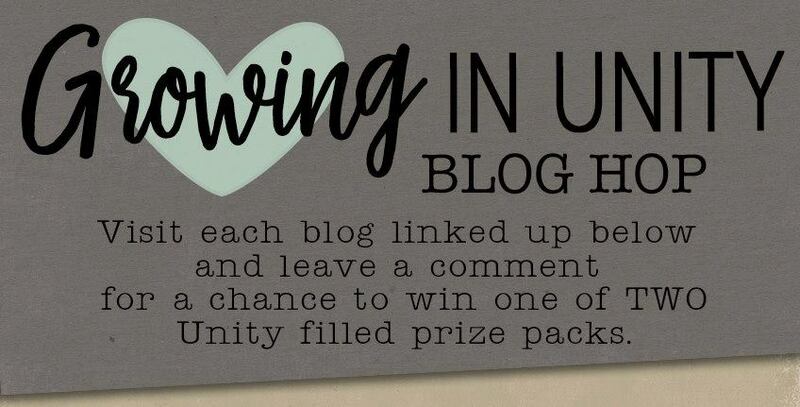 Welcome to the Spring Growing in Unity Spring Blog Hop! 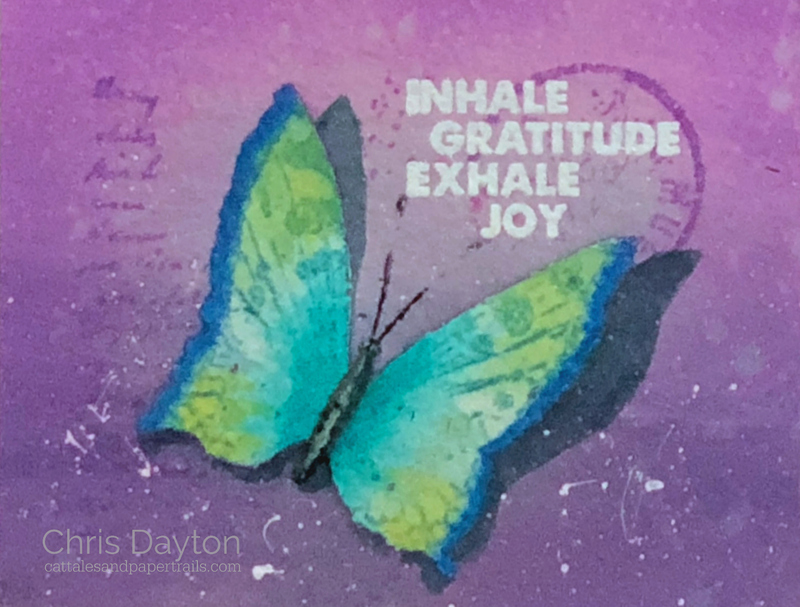 Today I am participating in a little blog hop with several of the other Unity Stamps Growing in Unity Gals, who have each had a to be a Unity Stamp Company guest designer for a week. My week as a GIU Girl began April 16th. If you would care to check out my five April guest posts, they begin HERE. 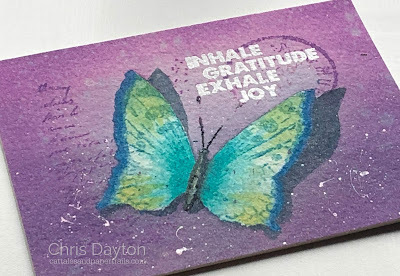 Today I have a watercolored card using the May 2018 SMAK Kit, Gratitude & Joy to share with you. I had hoped to have a short, edited video for this project. I had one; or so I thought. But when I went to edit it, I found there was a large problem: apparently I had some operator error with the record/stop recording button about midway through my day, so I was for quite a time, recording drying time rather than recording the actual painting time. And literally watching paint dry? I think we will skip that. My card began with a piece of 300# Arches cold press watercolor paper. (I buy the Arches in 9x12" blocks, and then cut the sheets to 4.5x6" for cardmaking.) I used my Original MISTI to stamp the butterfly image onto my watercolor paper using Inkon3's new Fade Out No Line Coloring Ink. I left the stamp in place in my MISTI so I could re-stamp later. I used my Fineline Masking Fluid Pen and a cheap flat paint brush to put down a thin layer of the making fluid which covered the butterfly entirely. (Make sure you clean your brush immediately!) I let the mask dry overnight. The next morning, I began watercoloring with my Sennelier L'Aquarelle watercolors and my new Escoda Reserva Travel brushes that I was spoiled with on Mother's Day. They are amazing quality, and are so pretty. They are just as beautiful as they feel, and the paint fabulously. I wet the background with clean water, then put a layer of a light violet. Then let it dry. I added a second layer of slightly deeper violet. Then let it dry... and so on. Watercoloring is definitely an exercise in patience. When I watercolor, the actual process often takes all day, so I often will have several paintings in process, or I'll watercolor on the day I do laundry. Then my project can dry while I go fold and switch out loads of clothes. Depending on the amount of water, each layer can take from 15-60 minutes to dry. Today's project took all day. But truly, if it weren't for dry time? I probably only actually painted or stamped for 60-70 minutes, I just did 5-10 minute increments at a time. With each thin layer, the color is built up gradually and you can have a certain luminosity in your colors that you can't always get with a single darker layer of watercolor. Once I was satisfied with my background color, I went back to my MISTI to re-stamp. I placed my paper in the exact same corner of my MISTI and stamped the image, this time using Wilted Violet Distress Oxide ink. I had to stamp 3 times, using light pressure on the lid to make sure the ink was dark enough, and that I had gotten enough ink into the textured surface of the paper. I didn't want to force the ink to the paper with hard pressure, or I would smash the stamp and lose the crispness of the image and script. The liquid mask was still protecting my butterfly, so I was only stamping the background. Again, I left my stamp in place in my MISTI for later. I wanted to create a bit of a mottled background, so I added some Wilted Violet ink with a foam blender to add a bit more color to my paper, then spritzed it with water droplets, let it sit a minute or two, then gently picked up the water, and the color it had lifted, with a paper towel. When my panel was fully dry, I added some tiny spatters of slightly watered-down white acrylic paint for more interest. My next step was to remove the mask. Making sure my panel was VERY dry, so I wouldn't tear or damage the surface of the watercolor paper, I used a rubber adhesive remover eraser to very gently lift and peel off the masking fluid coating. This left my butterfly rather starkly white, with only my faint Fade Out Ink image. Much like as I painted the background, I painted the butterfly in several very pale layers, letting it dry between layers, and colors, building up the color very slowly. I also added a cast shadow, tentatively sketching it in first with plain water, then painting layers of a blue/Payne's Gray mixture. When I was happy with it, and it was dry, I once again went back to my MISTI. I very carefully, selectively inked small portions of the butterfly at a time with Distress ink cubes and stamped the details back over the butterfly. I used Black Soot on the body and antennae, and Broken China over the wings. Next I trimmed my panel down to 4.25x5.5" and stamped my sentiment in embossing ink, and heat embossed with white. I also spritzed the entire panel with Sheer Shimmer: Sparkle to give it some extra shine and sparkle. When this was completely dry, I mounted my panel to an A2 top-fold card base with liquid glue, and weighted it down well with a heavy box so it would dry very flat. Thanks for stopping by today! I hope you enjoy today's hop! Your next stop should be Avra's blog, but before you go, leave a comment here on this blog post, and on the other five stops along the hop to be entered to win one of two prize packs of Unity Stamps! beautiful. I love the butterfly stamp. Gorgeous! Love your details too. Gorgeous! I agree with first commentor, this is a work of art! This is quite a process, but certainly worth it. Painting a shadow of the wings really made them pop. You never disappoint Chris! Beautiful card. Now I need to add that set to my wish list! Love the tutorial. I learned two things I didn't know. I had not thought of waiting between the water color layers to control the opacity with out having to go darker with the saturation with it is still wet. I also had not heard of the no line ink and yes, went immediately to order it. I will be applying what I've learned, thank you for the inspiration! Fabulous! Always amazed by your technique. Wow! Gorgeous! Will you teach me how to watercolor? And have patience? LOL! Your card is gorgeous - I love the colours and you made me laugh about the video. Watching paint dry - too funny! True-this is art. Way above and beyond. Wow! Loved hearing about your process....so much detail went into this gorgeous creation. Thank you for sharing. Wilted violet..love the color and the name!!! Beautiful!! Sorry about your video, would have loved to see that, but thanks for not showing us "paint drying" lol. But thanks for all the steps. Your card is beautiful and your coloring is stunning. So pretty! Thanks for sharing the 'how to' What a fabulous project! OMGoodness! Such a beautiful project! I love the 3D look. PRETTY!!!! Wow luminosity is the word to describe your card. It is amazing and beautiful. It was worth the time and effort it took for you to make this creation. It looks as if a bright light is shining on it! Thanks so much. Not enough patience here, so greatly appreciate the time and effort for this beauty! You are an extremely patient artist, but your final result is amazing! I am going to have to research the Fade Out no-line coloring Ink. I haven't heard about this product. Thanks for all your hard work. Such a beautiful design. Just love your artwork. Your butterfly card is so beautiful! I love the purple background! Thank you for sharing how you made the background. I just re-read the tutorial. This is ONE SPECIAL card. I don't know if I have the "watercolor patience", but I'm glad you do. Thanks for sharing this creation. Very interesting process. I understand the watercolor process, it is time consuming! I love how you masked off the primary image to color the background. I’ll need to try that. I guess it could also work if the stamp required multiple colors. Great card! Chuckling on the video of it drying. I love the soft effect this card has! Ohhhh… love the magical feeling of your card. The color scheme is so very pretty and the shadow you painted on makes the butterfly looks like it is ready to take flight! So Beautiful!! I liked reading about your process - so informative - this is a work of art! Thank you for the inspiration! Wow, every work of art is a labor of love! Thanks for sharing your process! This is beautiful and worth every minute you spent on it.